There are a number of market forces that are driving the rapid and widespread adoption of telemedicine. Patients are increasingly demanding remote medical services with as many as one in five consumers willing to switch from a provider who does not offer telemedicine services to one that does. Providers are also looking to introduce the technology because of the many advantages it offers practices in terms of increased revenue, more flexibility, lower costs, and better work/life balance. All of these considerations are important, but only if they result in improved patient outcomes through safe and effective clinical treatment. To be useful, telemedicine must produce healthy and happy patients. Fortunately, that is exactly what it can achieve. We’ll talk about the health benefits that telemedicine patients enjoy, but let’s start by looking at the ways that telemedicine is used to promote better health. Follow-up visits are an important way for physicians to validate that they have made the right diagnosis and developed the best treatment plan. Unfortunately, many patients don’t keep follow-up appointments due to the expense and hassle of getting into the office. Video follow-up makes it easy for patients to comply, increasing the odds that treatment will be successful. When patients have diagnostic imaging or laboratory workups, it is essential that they understand exactly what the results of those tests reveal and what further action is necessary. It isn’t always possible or necessary for the patient to come back into the office to review the results, but the telephone can prove an inadequate tool for communicating important information. In addition, majority of these types of phone calls are not reimbursable. Telemedicine is a perfect solution, giving the patient and provider the face-to-face engagement that improves understanding, deepens the relationship, and allows practices to be reimbursed for their time. According to data released by the National Health Council, chronic conditions affect approximately 133 million Americans, representing more than 40% of the total population. People with chronic conditions are already burdened by the illness itself, so the effort involved in managing it only adds to the load. Telehealth can be used to reduce the number of office visits chronically ill people must make, increasing the chances that they will be compliant with their treatment plan. The Veteran’s Administration introduced a care at home program in 2003 to provide care for veterans with chronic conditions. The results were fantastic. Hospital readmissions are costly and disappointing for patients and providers alike. Telemedicine is ideally suited for improving patient outcomes post-hospitalization by allowing for easy follow-up even before the patient is ready to leave home for an office visit. Providers can assess the patient’s condition and response to treatment, allowing them to intervene before readmission becomes necessary. Telemedicine has been found to be a safe and effective way to treat depression and other chronic mental health conditions. It removes barriers to access, lets the limited number of providers see more patients, and eliminates privacy concerns. Patients who may be unwilling to seek treatment for a mental health condition under normal circumstances can often be convinced to do so via video. A study by researchers at the Medical University of South Carolina and the Ralph H. Johnson VA Medical Center in Charleston followed 241 depressed elderly veterans, some of whom received treatment via telemedicine, while others received in-person care. At the end of one year, there was no meaningful difference in symptom relief or satisfaction between the two groups. Telemedicine has also proven to be useful in the treatment of PTSD. “The best treatment for PTSD, with the most empirical support, can be delivered at no loss of effectiveness, directly into a veteran’s home, rather than having the veteran come into clinic. We can now save the travel time and bring the treatment right to them,” explained Ron Acierno, author of a Veterans Administration study on the subject. Patients on a short or long-term course of medication may be reluctant to schedule an in-person visit to discuss potential side effects or concerns about efficacy. Some continue to suffer from side effects, while others simply stop taking the medication altogether. A remote visit is a perfect way to easily and cost effectively check in with patients to see if there are any questions or concerns. Patient outcomes can often be improved with a change of dose or medication. Why is Telemedicine Able to Improve Patient Outcomes? 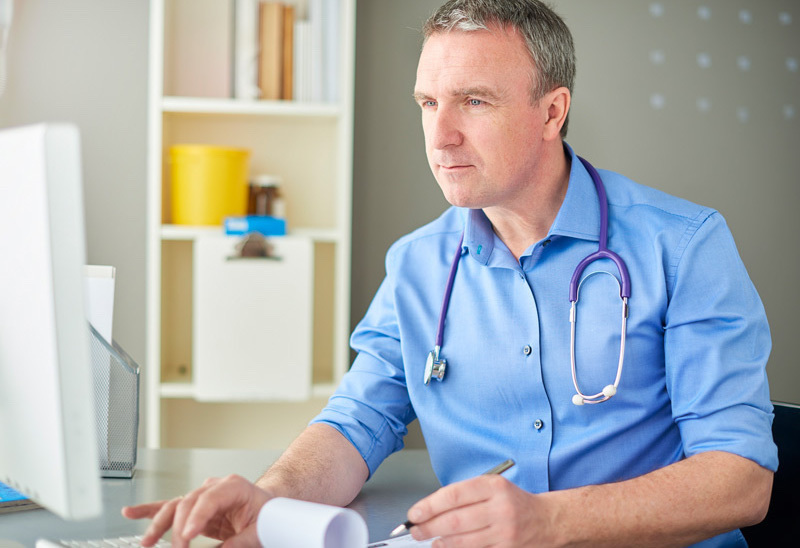 Because telemedicine happens outside of the busy office environment and it is very focused on the present concern, there is often more face to face time spent discussing the patient’s complaint. It is far more effective than the telephone for communicating complex information and conveying the empathy and understanding that gains trust. There are lots of things that keep patients from getting the care they need. Transportation costs and time, missed time from work, sometimes resulting in reduced pay, child and elder care issues, and just pure inconvenience all keep patients from getting into the office. In a worst-case-scenario for providers, they result in no-shows and last minute cancellations. Sometimes the barrier is that there isn’t access to the right specialist nearby. Telemedicine leads to improved patient outcomes by removing all of these hurdles. Specialists can see patients from a wide geography and patients only spend time and money on the valuable interaction with the provider. All of the other waste associated with an office visit is eliminated. Hospital or medical office born illnesses are the antitheses of improved health outcomes, but they are a risk every time more than one patient shares the same space. Doctor’s offices are where they keep the sick people after all. The telemedicine alternative allows contagious people to get the care they need without exposing others and keeps individuals who don’t have a virus or bacteria from getting them. This is good news for patients and providers alike. A comprehensive treatment plan often involves steps that don’t naturally make sense in an in-person setting. Medication management and diagnostic test review certainly fall into this category. In addition, important aspects of treatment like smoking cessation and weight management are perfect for video follow-up. Telemedicine gives providers a solution for a broader range of care without added costs or burden on a busy office. What Do Improved Health Outcomes Mean for Patients? It all comes down to how patients feel, both physically and emotionally. Telemedicine improves patient well-being overall, but there are few specific areas where the results for patients are particularly apparent. Staying out of the hospital is a goal for most patients and providers. Adequate follow-up care, careful medication management, and timely monitoring of chronic illness all go a long way toward keeping people well and at home. Writing for Health Affairs, Lesley Cryer, Scott B. Shannon, Melanie Van Amsterdam, and Bruce Leff reported on one program that lowered costs and improved outcomes by keeping patients at home. Whether a patient’s illness is severe and chronic, or just a passing concern, getting the care they need in the most convenient way possible improves people’s satisfaction with their provider and with the quality of their own life. The goal is to provide access to quality care without the hassle and expense of traditional channels for delivery. The ability to see a provider when needed, on the patient’s terms increases their feeling of empowerment and willingness to engage in their own care. Video visits are an easy way for patients and providers to connect, with all of the benefits of in-person communication without the sacrifice of an in-person encounter. When we talk about the cost of healthcare for patients, we think of things like co-payments, deductibles, and uncovered treatments. But there is a whole other category of expenses for patients. Transportation costs, time missed from work that results in no pay or the use of precious paid time off, money paid to child-care providers, and the opportunity costs of sitting in a waiting room. By eliminating all of this telemedicine improves the patient’s financial outcome as well as their health outcome. Telemedicine is convenient and cost effective, but more importantly, it improves patient outcomes, helping people get and stay healthy and remain engaged in their care. It is a great way for providers to gain patient loyalty and improve practice profitability all while providing the highest quality care. Request a personalized demo to offer patients convenient video visits today!